"My butcher Harry at the Eastmoreland Grocery gave me this recipe about 30 years ago. It's easy to make, uses ordinary ingredients, and is delicious barbequed or oven broiled." In a blender, combine the soy sauce, honey, vinegar, ginger, garlic powder, and vegetable oil. My family loved this recipe. I used 1/4 cup olive oil instead of 1/2 cup veg oil. I marinated it for 24 hours and sliced it thinly when done, and it was very tender! 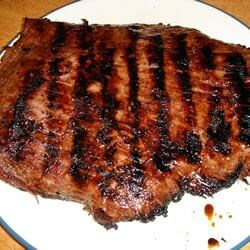 This marinade added a blast of flavor to my flank steak. I was surprised how good it tasted, especially considering how easy it was to prepare. I marinated this overnight and broiled it about 4 inches from the heat for 14 minutes and it turned out perfectly medium. My husband and I both really enjoyed this. Well, I'm not sure what happened, but this wasn't great. It smelled really terrific as it was marinating, but it tasted off - almost like wild game! Very odd. Probably won't try again.